Created from the need to support Davidson College almost 200 years ago, Main Street is now the physical and symbolic backbone of the city of Davidson, North Carolina. The street’s quintessential American feel and historic charm have been preserved over time through the efforts of an active community. The Main Street Halloween march brings local merchants and residents together to celebrate. Photo courtesy Town of Davidson. The primary section of Main Street is a quarter-mile between Depot Street and Jackson Street. Davidson's Main Street is a short segment within a much larger NC Highway 115 with connections to Cornelius and Huntersville to the south, and Mooresville to the north. Residents partaking in the Main Street Gallery Crawl, part of the "April is for Arts" celebration. Photo courtesy Town of Davidson. Norman Rockwell could not have imagined a more charming small town street than Main Street in Davidson. Flanked by picturesque shop fronts, the village green, a library, post office, churches, historic homes, a college, and even a “soda shop," Main Street binds the community together. Many of the original Davidson College buildings survive today because of citizen commitment to preserving the town’s identity as a small college town and Piedmont railroad community between the antebellum period and the mid-20th century. Citizens advocated for a historic designation and improvements, while nonprofits and community groups partner with local businesses to sponsor Main Street festivals and events. When the North Carolina Department of Transportation (NCDOT) proposed widening Main Street in the 1990s, town planners and residents advocated for alternatives to preserve the street's pedestrian and bike-friendly character. Residents also pressured NCDOT to lower the speed limit. NCDOT has continued to make improvements to the pedestrian infrastructure, most recently giving pedestrians a head start when entering an intersection at three signals along the thoroughfare. The intimate streetscape design shapes Main Street’s character. Brick sidewalks feature plaques detailing structures of historic significance. They blend nicely with shop fronts and quaint signage, which must be approved by the design review board. Planners have supported investment in public art, wayfinding signage, and two-hour public parking limits on Main Street. Crosswalks traverse the street in multiple locations. Benches augment the interactive streetscape and provide opportunities for rest, conversation, or people-watching. Town planning efforts promote non-motorized transportation alternatives: the town was recognized with both “Walk-Friendly” and “Bike-Friendly” award designations. Bike lane markings were painted in late 2013. Public spaces such as the village green, Summit Coffee stage, or Dance of Life are accessible to both the pedestrian and bicyclist, and bike racks line the street. Town residents enjoying the summer Concert on the Green series. Photo courtesy Town of Davidson. Planning ordinances established a small local historic district centered on Main Street aimed at preserving historical buildings, many in the Greek Revival-style. Property owners must obtain a Certificate of Appropriateness for any work completed in the historic district. State officials approved the creation of a new National Historic District encompassing 580 properties centered on Main Street. Homes on Main Street include fine examples of Queen Anne, Colonial Revival, Tudor Revival, and Craftsman styles. The Soda Shop has been popular with students and residents since opening in 1951. Other popular local establishments include Toast Café, Main Street Books, Summit Coffee & Tea, The Village Store, Flatiron Kitchen, Mestizo, and Kindred. The town’s economic and community development manager holds quarterly meetings with Main Street merchants, and many business owners take active roles on planning committees. The village green hosts festivals, gatherings, and concerts adjacent to the public library where the Davidson Book Garden is a popular piece of interactive public art. Great effort was made to preserve a large heritage water oak on the site. The Public Arts Commission initiated the project to honor the town’s literary and academic history, and provide a sheltered spot for reading. Main Street is the heart of Davidson’s burgeoning foodie scene. In 2015, the town worked with a new restaurant to create outdoor seating on publicly owned land for use by the restaurant. Davidson Farmers’ Market is a producer-only, year-round market featuring more than 35 farmers and local producers. Eleven joint trash/recycle receptacles along Main Street were funded through a matching grant from the state Department of Environment and Natural Resources (DENR) Division of Pollution Prevention and Environmental Assistance. Davidson Design for Life (DD4L) aims to foster healthy community design through health impact assessments, public participation, and collaborative efforts. A recent assessment analyzed Davidson’s street design standards and examined ways to improve public health by promoting physical activity and improving air quality through decreased automobile travel. Christmas in Davidson is Main Street’s largest and most popular event. Over 30,000 people attend this annual three-day festival to support local merchants, enjoy holiday entertainment, ride in a horse-drawn carriage, or stroll Main Street. The event culminates with the North Mecklenburg Christmas Parade, a 30-year tradition. 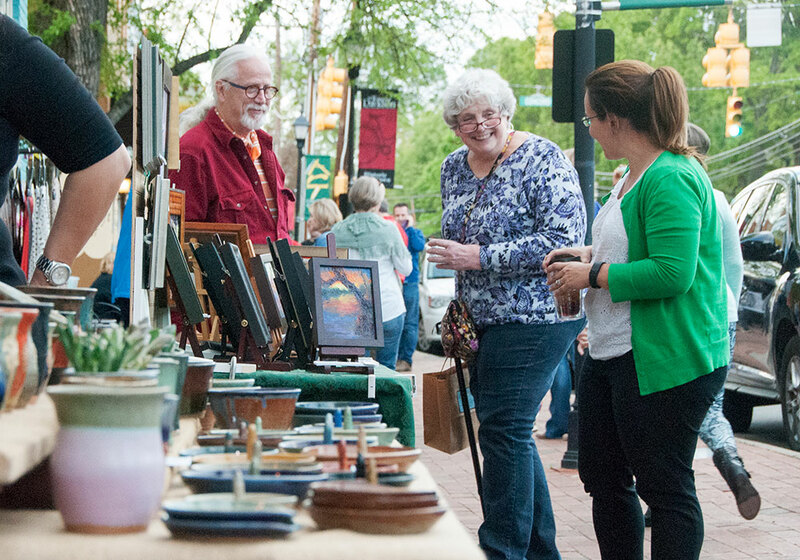 April is for Arts is a celebration of art and culture and includes a Gallery Crawl on Main Street and Art on the Green, a two-day festival with music, and booths for artisans. 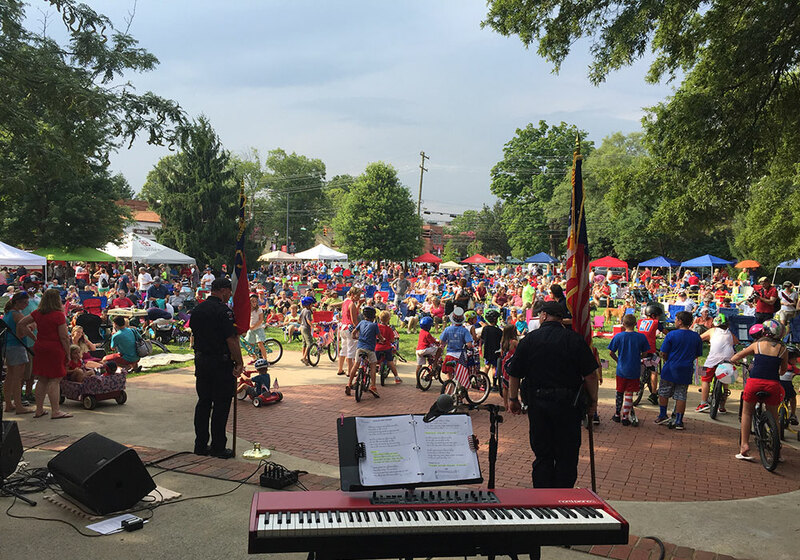 The Concerts on the Green Series presents free, family-friendly concerts throughout the summer months on the village green, averaging 2,000 attendees. Town Day celebrates community service accomplishments of Davidson’s citizens. The Green Day Sustainability Festival celebrates green living efforts with nonprofit exhibitors, musicians, and road races. 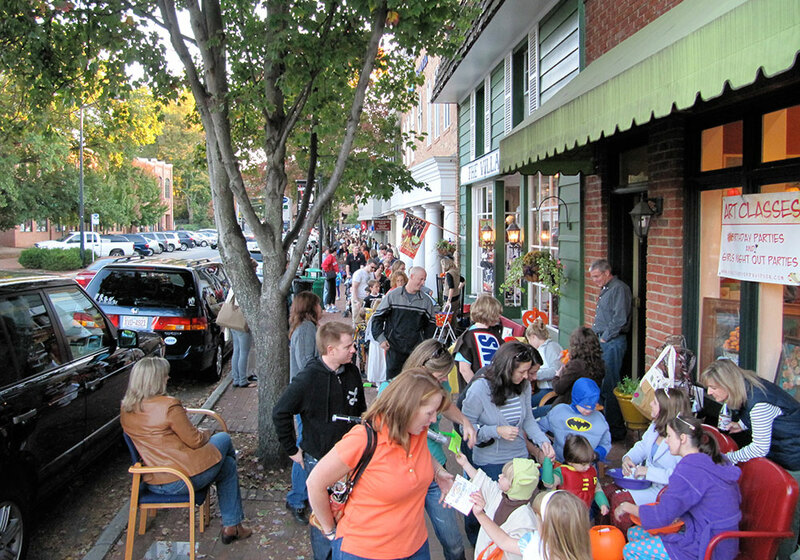 During the Halloween Parade, Main Street merchants hand out candy to trick-or-treaters strolling through the village.